FRIDAY, Oct. 17, 2014 (HealthDay News) -- Daily vitamin D supplements might help children with eczema that gets worse in the winter, a new study suggests. When eczema, a chronic inflammatory skin disorder, flares up in the winter it's known as winter-related atopic dermatitis. Researchers found vitamin D significantly reduced the uncomfortable symptoms associated with this disorder. "While we don't know the exact proportion of patients with atopic dermatitis whose symptoms worsen in the winter, the problem is common," said study leader Dr. Carlos Camargo, of Massachusetts General Hospital's department of emergency medicine. "In this large group of patients, who probably had low levels of vitamin D, taking daily vitamin D supplements -- which are inexpensive, safe and widely available -- proved to be quite helpful," he said in a hospital news release. A common treatment for severe atopic dermatitis is the controlled use of ultraviolet light, which stimulates production of vitamin D in the skin, the study's authors said. In conducting their research, they explored the possibility that vitamin D deficiency -- the so-called sunshine vitamin -- could help explain why the condition often gets worse during winter. The study, conducted with the help of scientists at the Health Sciences University of Mongolia, involved 107 Mongolian children between the ages of 2 and 17 from nine outpatient clinics in the capital city of Ulaanbaatar. All of the children had atopic dermatitis that flared up in cold weather or during the transition from fall to winter. The participants were randomly divided into two groups: those who received a 1000 IU daily dose of vitamin D and those who received a placebo. The children's symptoms were evaluated when the study began, and one month later when it ended. The children's parents were also asked whether or not they felt their child's skin condition had improved. 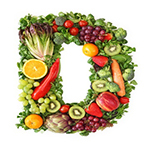 The study, published in the October issue of the Journal of Allergy and Clinical Immunology, revealed the children who received the vitamin D supplements had an average 29 percent improvement in their symptoms. In contrast, the children who received the placebo had a 16 percent improvement. Although the study authors did not determine whether or not the children in the study had a vitamin D deficiency when the study began, they pointed out that another larger study involving Mongolian children found 98 percent had low levels of vitamin D. The researchers said it was very likely the children in their study also had this deficiency. Although more studies are needed to determine if vitamin D could help adults and children with year-round symptoms of atopic dermatitis, the researchers concluded children with symptoms that get worse during the winter months could try a vitamin D supplement for a few weeks to see if their condition improves. They advised parents to discuss the benefits of vitamin D and the findings with their child's doctor.